Detective Sergeant Rod Barnes surveyed the remains of Manton Rempville monastery with a certain amount of incredulity. He’d heard that 100,000 pounds had been spent on preserving the ruins and he couldn’t understand why anyone would do such a thing. Ruins were ruins for a reason and that reason was because the natural order of things, in Barnes’s mind at least, was gradual decay – preservation was only delaying the inevitable, like applying skin cream to wrinkles or a new coat of paint to a rusting car. The ruins were open to anyone and there was no entry charge, so they were never going to get their money back. Barnes stiffened slightly as he saw DI Colin Knowles’s Land Rover chug into the car park and lurch to a halt too close to Barnes’s Morgan sports car for his comfort. He glanced down at the body and thought that Knowles would find this crime scene very interesting indeed. Knowles was on a new diet and his latest culinary delight was vegetable kebabs cooked on his nearly new barbecue. Even in the depths of winter. Barnes walked across the uneven grass as a low, cold wind whipped across the historical site. He hadn’t seen much of Knowles in the past month as they’d both been away on holiday at separate times. 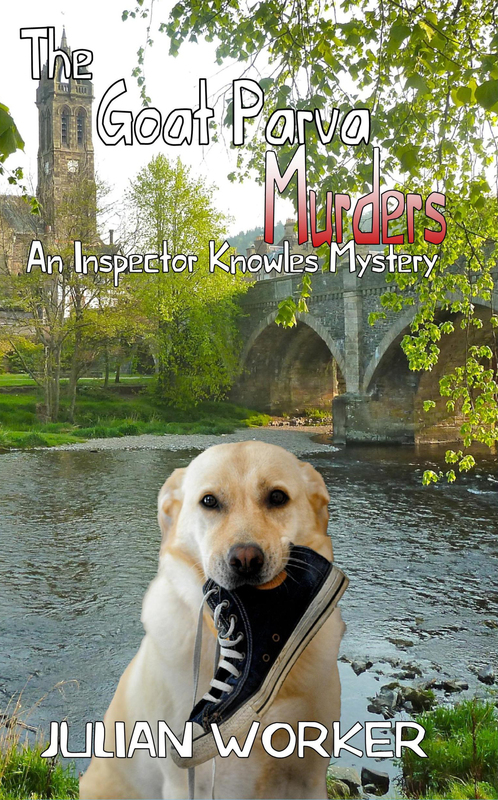 The two men started to walk over to the eastern wall of the monastery’s refectory where the body had been found an hour earlier by Bingo the retriever, out on a long walk with his owner Adelaide Hills from Goat Parva. Both dog and owner were well known to the police from a few weeks previously when Bingo had made a habit of finding bodies in the early morning. Knowles stood on what remained of the wall and looked down at the body lying on what would have been the refectory floor. Edward Morgan had been run through with a sword and the handle was sticking out of his back on the left-hand side. Knowles smiled at Dr Crabtree, the forensic doctor, who was examining the body. “So, you would have expected a murderer who knew what he/she was using to have hit Edward here in the neck with the sharp side,” replied Knowles. “They might be bluffing sir, so we shouldn’t just use that as a method of elimination from our enquiries,” said Barnes, playing along with Knowles’ quite acerbic sense of humour. The following morning Adelaide Hills was walking along the path between Doggett’s Field and the river when her retriever, Bingo, started barking madly. He was always energetic on his morning walk but today he did seem particularly fascinated with some footprints in the mud. She pulled Bingo away and they carried on towards the Baker-Clements’ mansion with Bingo looking back at all times. Bingo ran off into the bushes near the Baker-Clements’ garden; a pheasant flew away towards the river. Mrs Hills then saw Carly Waferr heading towards her carrying the mushroom basket that accompanied her on morning walks during the week. “I has,” said Carly, putting an arm across the top of the basket, “and you can’t have any. Unless you come for lunch of course,” she added smilingly. “Be no poisonous mushrooms in them woods,” said Carly, “well not poisonous to me at least, but I’m probably immune now. I ate a couple this morn.” She moved her head around in an anti-clockwise direction for five seconds before shaking her head vigourously. “This is a good shoe – Bingo where did you find this?” Mrs Hills gestured towards the bushes and Bingo flew off. Carly Waferr was trying on the shoe when Bingo returned with the other matching shoe. “My prayers have been answered, thank you lord,” shouted Carly and grabbed the shoe from the retriever. “They fit, it’s my day today,” she added. “Who leaves a pair of shoes for a dog to find?” wondered Mrs Hills as Bingo went back to the bushes. Bingo came bounding up with a belt. Mrs Hills raised her eyebrows and followed Bingo into the bushes. Carly was trying on the belt when she heard Mrs Hills scream. Sounds like Danica and this Alf character have been discovered by our Adelaide, thought Carly, I’d better hurry up, I don’t want to miss anything. As she started towards where the scream had come from Mrs Hills came running towards her. “He’s dead,” she shrieked, “Clem Shapiro’s dead. I’m calling the police; he was bird-watching by the look of it,” and she headed home following Bingo, who was carrying a glove that he didn’t want to share with anyone. Carly went to see the body. “Got your just desserts, Clem,” she said, “someone found out about you and the birds you were watching.” She looked through the rhododendrons and saw the Baker-Clements’ house. A peep show for perverts more like, she thought and headed back home to cook a mushroom omelette for her Wednesday morning breakfast. Colin Knowles was eating his breakfast of black pudding, baked beans, and two fried eggs when his mobile phone rang on the kitchen counter. Knowles hauled his overweight frame to an upright position and having run his fingers through what remained of his brown hair, he answered the ringing summons. Rod Barnes, his assistant, replied in his normal clipped tones. Knowles rang off and returned to the table but decided not to have more ketchup on his black pudding after all – why did people get bludgeoned to death so much – he couldn’t eat breakfast any more without thinking of previous cases. He moved the black pudding to his cat’s bowl – Gemma would love that after hunting in the garden and catching nothing as was normal. Poor cat. Knowles belched and lit a cigarette before remembering what his doctor had advised and put the noxious weed out by burying it with the others in the rubber plant by the door. Gemma came in through the cat flap looking upset and Knowles rubbed her head, before Gemma smelled the black pudding, rushed to her bowl and tucked into the food. No murders for her to remember, thought Knowles, other than two mice. And that rabbit. He was brought out of his reverie by the phone – it was Barnes again. Knowles had them in his hand already; somehow Doggett’s Field was always wet even in the height of summer. He got into his Land Rover and set off to Goat Parva, a place he’d always regarded as strange and immoral. Detective Sergeant Rod Barnes surveyed the remains of Manton Rempville monastery with incredulity. He’d heard that a hundred thousand pounds had been spent on preserving the ruins and he couldn’t understand why anyone would do such a thing. Ruins were ruins for a reason. The natural order of things, in Barnes’ mind at least, was gradual decay – preservation only delayed the inevitable, like applying skin cream to wrinkles or a new coat of paint to a rusting car. Besides, the ruins were open to anyone and there was no entry charge, so they were never going to get their money back. Barnes stiffened slightly as he saw Detective Inspector Colin Knowles’ Land Rover chug into the car park and lurch to a halt too close to Barnes’ Morgan sports car for his comfort. He glanced down at the body and thought that Knowles, his boss, would find this crime scene interesting indeed. Barnes had heard that Knowles was on a new diet and that his latest culinary delight was vegetable kebabs cooked on his nearly new barbecue even in the depths of autumn. Taking care not to get his highly polished shoes muddy, Barnes walked across the uneven grass as a low, cold wind whipped across the historical site, slightly disturbing his short, brown hair. He hadn’t seen much of Knowles in the past month as they’d both been away on holiday at separate times since the murders in Goat Parva. As he came towards him, Barnes noticed that even though the Inspector had lost weight, he still wasn’t able to tuck his Marks and Spencer shirt into his trousers. “Fair to middling, Barnesy old son, the diet’s working well, nearly fifteen pounds lost.” Knowles gripped his much reduced stomach with some pride. “Good point, Sergeant, lifestyle sounds very magazine-like though, very posh Sunday newspaper, but I know what you mean. Anyway, who do we have over there?” Knowles pointed in the direction of the photographer and Forensics team, who were investigating the crime scene. The two men started to walk over to the eastern wall of the monastery’s refectory where the body had been found an hour earlier by Bingo the retriever, out on a long walk with his owner Adelaide Hills from Goat Parva. Both dog and owner were well known to the police from a few months before when Bingo had made a habit of finding bodies in the early morning. With his hands in his trench coat pockets, Knowles stood on the wall and looked down at the body lying on what would have been the refectory floor. Edward Pritchard had been run through with a sword and the handle was sticking out of his back on the left-hand side. Knowles smiled at Dr. Crabtree, the forensic doctor, who was examining the body. “Dr. Crabtree, we have a real sword being used as a murder weapon?” Knowles would have rubbed his hands with glee if they hadn’t been warming up in his pockets. “Any prints on the handle?” Knowles looked hopeful when he said this. “So, you would have expected a murderer who knew what he was using to have hit Edward here in the neck with the sharp side,” replied Knowles. “They might be bluffing, sir, so we shouldn’t just use that as a method of elimination from our enquiries,” said Barnes, playing along with Knowles’ quite acerbic sense of humour. I went to see the stage version of 1984 on September 4th at the Playhouse Theatre. The production last 101 minutes and was an emotionally draining, but ultimately fascinating piece of theatre. As well as being an accurate condensation of the book, the play asked how much of the 1949 novel is true today and audience members’ answers will probably vary depending how much interaction they have with ‘the authorities’. The use of strobe lighting, video, and quick changes of scene left me giddy at times, but my awareness of being watched was certainly heightened – after leaving the theatre I did notice how many security cameras there are around London. The scene with Winston in Room 101 was harrowing and not for the faint-hearted. If you should ever have a chance of seeing this play, go and see it. If not, please read the book and see for yourself whether you recognise the modern day. It won’t be “the worst thing in the world” you will ever do.